Preheat oven to 180°C/350°F. Beat together soft butter, sugar, vanilla sugar, salt, egg yolks, and vanilla extract in a bowl. In another bowl, mix together flour, starch, and ground almonds and add alternately to the butter-egg mixture, until a smooth dough forms. Form dough into a ball, wrap in plastic wrap, and place in the fridge for approx. 30 min. Split the dough into balls the size of a large walnut and place on a lined baking sheet. Lightly flatten the balls and, using the end of a cooking spoon or your thumb, create a small well in the center of each cookie. In a bowl, whisk together egg and milk and brush cookies with the mixture. Warm jam in a saucepan over medium heat, until smooth in texture, then add 1 tsp. to the well of each cookie. Bake at 180°C/350°F for approx. 10 min., or until golden brown. 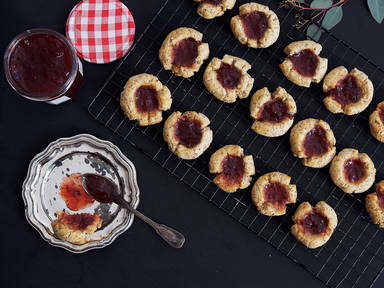 Leave to cool and top cookies with any remaining jam, if desired. Enjoy!